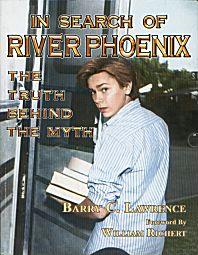 The complete book about the life of Academy Award nominee River Phoenix, from his parents beginning, his birth, member of a cult religion, to his TV acting, activism, veganism and movie career. "An exciting blend of drama and documentary- a must read." "This book is great value to the memory of River and to those who want to know more about him"
"Barry Lawrence's book far surpasses the existing biographies out there because of his tireless efforts to get to the truth and squash the rumors." "This book gave me 'everything' I wanted."